In an increasingly technological world, it isn’t uncommon to see new digital features in places that we wouldn’t normally expect. For example, a GPS-enabled water bottle or a temperature-regulating coffee mug. Products like these enhance the user experience and simplify everyday life. In the retail world, it is imperative for customers to feel engaged to have a positive shopping experience. Digital shelf devices are both attractive and interactive for the customer. As part of our Dana Total Retail Solutions™, we now offer several different digital solutions for retailers. Is shopping a necessary chore for you? Are the aisles boring and monotonous? Why not watch TV while you’re at it! Dana Shelf Video Strips attach to store shelves and can be placed either horizontally or vertically. They are available with 4 or up to 12 screens, and can be programmed to play short videos or advertisements of your choosing. Are shelf talkers more your style? Dana has a digital solution for that too! Thanks to our partnership with Fidget™, we are able to combine the advertising effectiveness of a shelf talker with the web-enabled technology of a beacon. Based on proximity marketing, you can easily and effectively reach out to your customers. If you want to take customer interaction to the next level, why not consider implementing Dana Tablets in your store? Included with our tablets is easily programmable software which will allow you to customize your tablet to your liking. Include a video that describes your product, or a scannable coupon code. Make it extra fun with an interactive quiz with a small prize at the end! 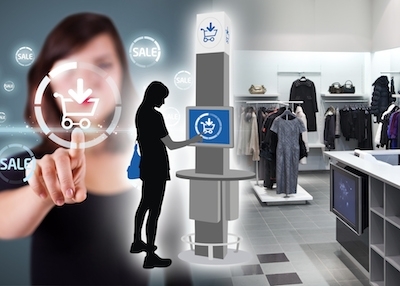 Here at Dana, we recognize that staying at the forefront of retail technology ensures a positive retail experience for both the customer and the company. Because of this, we make sure that the implementation and maintenance of our digital solutions is as easy and stress free as possible. Contact us today for more information about our digital technologies and our full product line!